Jürgen Habermas (UK: /ˈhɑːbərmæs/, US: /-mɑːs/; German: [ˈjʏɐ̯ɡn̩ ˈhaːbɐmaːs]; born 18 June 1929) is a German philosopher and sociologist in the tradition of critical theory and pragmatism. He is perhaps best known for his theories on communicative rationality and the public sphere. In 2014, Prospect readers chose Habermas as one of their favourites among the "world's leading thinkers". 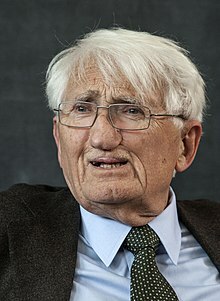 Associated with the Frankfurt School, Habermas's work focuses on the foundations of epistemology and social theory, the analysis of advanced capitalism and democracy, the rule of law in a critical social-evolutionary context, and contemporary politics, particularly German politics. Habermas's theoretical system is devoted to revealing the possibility of reason, emancipation, and rational-critical communication latent in modern institutions and in the human capacity to deliberate and pursue rational interests. Habermas is known for his work on the concept of modernity, particularly with respect to the discussions of rationalization originally set forth by Max Weber. He has been influenced by American pragmatism, action theory, and poststructuralism. Several noted academics have provided various criticisms of Habermas's notions regarding the public sphere. John B. Thompson, a Professor of Sociology at the University of Cambridge and a fellow of Jesus College, Cambridge, has claimed that Habermas's notion of the public sphere is antiquated due to the proliferation of mass-media communications. Habermas argued that Nolte, Stürmer, Hildebrand and Hillgruber had tried to detach Nazi rule and the Holocaust from the mainstream of German history, explain away Nazism as a reaction to Bolshevism, and partially rehabilitate the reputation of the Wehrmacht (German Army) during World War II. Habermas wrote that Stürmer was trying to create a "vicarious religion" in German history which, together with the work of Hillgruber, glorifying the last days of the German Army on the Eastern Front, was intended to serve as a "kind of NATO philosophy colored with German nationalism". About Hillgruber's statement that Hitler wanted to exterminate the Jews "because only such a 'racial revolution' could lend permanence to the world-power status of his Reich", Habermas wrote: "Since Hillgruber does not use the verb in the subjunctive, one does not know whether the historian has adopted the perspective of the particulars this time too". Habermas and Jacques Derrida engaged in a series of disputes beginning in the 1980s and culminating in a mutual understanding and friendship in the late 1990s that lasted until Derrida's death in 2004. They originally came in contact when Habermas invited Derrida to speak at The University of Frankfurt in 1984. The next year Habermas published "Beyond a Temporalized Philosophy of Origins: Derrida" in The Philosophical Discourse of Modernity in which he described Derrida's method as being unable to provide a foundation for social critique. Derrida, citing Habermas as an example, remarked that, "those who have accused me of reducing philosophy to literature or logic to rhetoric ... have visibly and carefully avoided reading me". After Derrida's final rebuttal in 1989 the two philosophers did not continue, but, as Derrida described it, groups in the academy "conducted a kind of 'war', in which we ourselves never took part, either personally or directly". Das Christentum ist für das normative Selbstverständnis der Moderne nicht nur eine Vorläufergestalt oder ein Katalysator gewesen. Der egalitäre Universalismus, aus dem die Ideen von Freiheit und solidarischem Zusammenleben, von autonomer Lebensführung und Emanzipation, von individueller Gewissensmoral, Menschenrechten und Demokratie entsprungen sind, ist unmittelbar ein Erbe der jüdischen Gerechtigkeits- und der christlichen Liebesethik. In der Substanz unverändert, ist dieses Erbe immer wieder kritisch angeeignet und neu interpretiert worden. Dazu gibt es bis heute keine Alternative. Auch angesichts der aktuellen Herausforderungen einer postnationalen Konstellation zehren wir nach wie vor von dieser Substanz. Alles andere ist postmodernes Gerede. —  From Jürgen Habermas - "Zeit der Übergänge" (Suhrkamp Verlag, 2001) p. 174f. Christianity, and nothing else, is the ultimate foundation of liberty, conscience, human rights, and democracy, the benchmarks of Western civilization. To this day, we have no other options. We continue to nourish ourselves from this source. Everything else is postmodern chatter. In his book Zwischen Naturalismus und Religion (Between Naturalism and Religion, 2005), Habermas stated that the forces of religious strength, as a result of multiculturalism and immigration, are stronger than in previous decades, and, therefore, there is a need of tolerance which must be understood as a two-way street: secular people need to tolerate the role of religious people in the public square and vice versa. …traditional Marxist analysis… today, when we use the means of the critique of political economy… can no longer make clear predictions: for that, one would still have to assume the autonomy of a self-reproducing economic system. I do not believe in such an autonomy. Precisely for this reason, the laws governing the economic system are no longer identical to the ones Marx analyzed. Of course, this does not mean that it would be wrong to analyze the mechanism which drives the economic system; but in order for the orthodox version of such an analysis to be valid, the influence of the political system would have to be ignored. ^ Anders Bordum, "Immanuel Kant, Jürgen Habermas and the categorical imperative", Philosophy & Social Criticism 31(7), 2005. ^ Christian Damböck (ed. ), Influences on the Aufbau, Springer, 2015, p. 258. ^ "Habermas". Collins English Dictionary. ^ Max Mangold and Dudenredaktion: Duden Aussprachewörterbuch. In: Der Duden in zwölf Bänden. Volume 6, 6th edition, Dudenverlag, Mannheim/Leipzig/Wien/Zürich 2005 ISBN 978-3-411-04066-7, "Jürgen" p. 446 and "Habermas" p. 383. ^ Krech, Eva-Maria; Stock, Eberhard; Hirschfeld, Ursula; Anders, Lutz Christian (2009). Deutsches Aussprachewörterbuch [German Pronunciation Dictionary] (in German). Berlin: Walter de Gruyter. pp. 561, 629. ISBN 978-3-11-018202-6. ^ Simplican, Clifford; Stacy (28 October 2017). "Disabling Democracy: How Disability Reconfigures Deliberative Democratic Norms". Retrieved 28 October 2017 – via papers.ssrn.com. ^ Habermas, Jurgen. 2008. Between Naturalism and Religion: Philosophical Essays. (First chapter). ^ Habermas, Jurgen (1954). Das Absolute und die Geschichte: von der Zwiespältigkeit in Schellings Denken. Gummers. ^ Craig J. Calhoun, Contemporary Sociological Theory, Wiley-Blackwell, 2002, p. 352. ISBN 0-631-21350-3. ^ "Book of Members, 1780–2010: Chapter H" (PDF). American Academy of Arts and Sciences. Retrieved 19 April 2011. ^ Public space and political public sphere Archived 2012-02-04 at the Wayback Machine (pp. 2–4). ^ "The most cited authors of books in the humanities". timeshighereducation.co.uk. 2009-03-26. Retrieved 2009-11-16. ^ a b c Habermas, Jurgen (1981), Kleine Politische Schrifen I-IV, pp. 500f. ^ Müller-Doohm, Stefan. Jürgen Habermas. Frankfurt, Suhrkamp, 2008 (Suhrkamp BasisBiographie, 38). ^ a b Calhoun (2002), p. 351. ^ a b Blanning, T. C. W. The French Revolution Class War or Culture Clash?, New York: St. Martin's Press (1987), 2nd edition 1998, p. 26. ^ a b Blanning (1998), pp. 26–27. ^ a b c d e f Blanning (1998), p. 27. ^ a b c d e Calhoun (2002), p. 353. ^ a b Calhoun (2002), p. 354. ^ Payrow Shabani, Omid A. (2003). Democracy, Power and Legitimacy: The Critical Theory of Jürgen Habermas. University of Toronto Press. p. 49. ISBN 978-0-8020-8761-4. ^ a b Calhoun (2002), p. 355. ^ "Jesus College website". cam.ac.uk. Archived from the original on 1 June 2008. Retrieved 28 October 2017. ^ "Departments - The New School for Social Research (NSSR)". www.newschool.edu. Retrieved 28 October 2017. ^ a b Ritzer, George, Sociological Theory, From Modern to Postmodern Social Theory (and Beyond), McGraw-Hill Higher Education, New York, New York, 2008, pp. 567–568. ^ Habermas, Jürgen, "A Kind of Settlement of Damages On Apologetic Tendencies In German History Writing", pp. 34–44 from Forever In the Shadow of Hitler? ed. Ernst Piper, Humanities Press, Atlantic Highlands, 1993, p. 43. ^ Habermas, Jürgen "A Kind of Settlement of Damages" pp. 34–44 from Forever In The Shadow of Hitler? ed. Piper (1993), pp. 42–43. ^ Habermas, Jürgen "A Kind of Settlement of Damages" pp. 34–44 from Forever In The Shadow of Hitler? ed. Piper (1993), pp. 37–38. ^ Fest, Joachim, "Encumbered Remembrance: The Controversy about the Incomparability of National-Socialist Mass Crimes", pp. 63–71 & "Postscript, April 21, 1987", pp. 264–265 from Forever In The Shadow of Hitler? ed. Piper (1993), pp. 64–65. ^ Schulze, Hagen, "Questions We Have To Face: No Historical Stance without National Identity" pp. 93–97 from Forever In The Shadow of Hitler? ed. Piper (1993), p. 94. ^ Möller, Horst, "What May Not Be, Cannot Be: A Plea for Rendering Factual the Controversy about Recent History", pp. 216–221, Forever In The Shadow of Hitler? ed. Piper (1993), pp. 216–218. ^ Geiss, Imanuel, "On the Historikerstreit", pp. 254–258 from Forever In The Shadow Of Hitler? ed. Piper (1993), p. 256. ^ Hildebrand, Klaus, "The Age of Tyrants: History and Politics The Administrators of the Enlightenment, the Risk of Scholarship and the Preservation of a Worldview A Reply to Jürgen Habermas", pp. 50–55, & "He Who Wants To Escape the Abyss Will Have Sound It Very Precisely: Is the New German History Writing Revisionist?" pp. 188–195 from Forever In The Shadow of Hitler? ed. Piper (1993). ^ Broszat, Martin, "Where the Roads Part: History Is Not A Suitable Substitute for a Religion of Nationalism", pp. 123–129, Forever In The Shadow of Hitler? ed. Piper (1993), p. 127. ^ Jäckel, Eberhard, "The Impoverished Practice of Insinuation: The Singular Aspect of National Socialist Crimes Cannot Be Denied", pp. 74–78 from Forever In The Shadow of Hitler? ed. Piper (1993), pp. 74–75. ^ Mommsen, Hans, "The New Historical Consciousness and the Relativizing of National Socialism", pp. 114–124 from Forever In The Shadow of Hitler? ed. Piper (1993), pp. 114–115. ^ Evans, Richard, In Hitler's Shadow, New York: Pantheon Books, 1989, pp. 159–160. ^ Thomassen, L. "Introduction: Between Deconstruction and Rational Reconstruction" in The Derrida-Habermas Reader, ed. Thomassen (2006), pp. 1–7. P.2. ^ Derrida, J., "Is There a Philosophical Language?" in The Derrida-Habermas Reader, ed. Thomassen (2006), pp. 35–45. P.37. ^ Habermas, J. and Derrida, J. "February 15, Or What Binds Europeans Together: A Plea for a Common Foreign Policy, beginning in the Core of Europe" in The Derrida-Habermas Reader, ed. Thomassen (2006), pp. 270–277. P. 302. ^ Habermas, Jurgen, Religion and Rationality: Essays on Reason, God, and Modernity, ed. Eduardo Mendieta, MIT Press, 2002, p. 149. And Habermas, Jurgen, Time of Transitions, Polity Press, 2006, pp. 150–151. ^ First Principles Journal– Recovering the Western Soul, Wilfred M. McClay (from IR 42:1, Spring 2007) – 01/01/09. Accessed: 2 December 2012. ^ Secularization and Cultural Criticism: Religion, Nation, and Modernity, Vincent P. Pecora..
^ "A misquote about Habermas and Christianity". habermas-rawls.blogspot.fi. 2009-06-08. Retrieved 28 October 2017. ^ A “post-secular” society – what does that mean? Archived 2009-03-29 at the Wayback Machine by Jurgen Habermas, June 2008. ^ Espinosa, Javier. "The religion in the public sphere. Habermas, Toland and Spinoza" (PDF). Universidad de Castilla-La Mancha. Archived from the original (PDF) on 2016-01-08. ^ (Papst), Benedikt XVI; Habermas, Jürgen (28 October 2017). Dialectics of Secularization: On Reason and Religion. Ignatius Press. ISBN 9781586171667. Retrieved 28 October 2017 – via Google Books. ^ Forum Libertas. 2006. Jürgen Habermas, pensador icono de la izquierda, reivindica el valor de la religión. ^ Buston, Fernando del. 2014. El Estado debe proteger a la religión. El Comercio. Date access January 10, 2015: "Jürgen Habermas ha acuñado el término de postsecularidad. Se da por fallida la idea central de la modernidad de que la religión iba a desaparecer y se establece una nueva relación entre razón y religión. Habermas plantea que es necesario emprender un aprendizaje mutuo entre las sociedades modernas y las creencias, o entre razón secular y fe. Se inicia una nueva época de mutuas tolerancias. La razón no puede echar por la borda el potencial de sentido de las religiones y éstas deben traducir sus contenidos racionalmente." ^ "The future of democracy, with Jürgen Habermas". KNAW. Retrieved 6 November 2013.